Background: Inpatient margins and hospital reimbursement have become increasingly dependent upon improving key metrics, such as length of stay and 30-day readmissions. Hospitalists typically lack access to credible, timely, and insightful metrics that inform their practice. In addition, individualized metrics, when available, struggle to properly normalize for patient complexity, warranted variations in care, shared decision-making, and variable hospitalist influence on outcomes—particularly in the event of handoffs. Purpose: The primary goal of this proof of concept study was to evaluate biweekly engagement of academic hospitalists across three hospitals to timely, individualized, and adjusted metrics on a mobile application. The secondary goal was to compare the length of stay changes between user and non-user hospitalists of the tool. 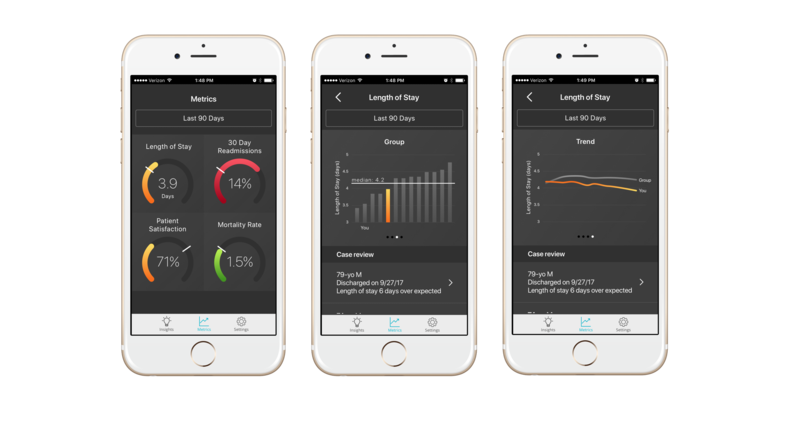 Description: A mobile application that presents up-to-date individualized metrics was introduced to fifteen hospitalists. The application pulls data on a daily basis via a recurrent feed from the hospital’s electronic medical record system and continuously calculates and normalizes individualized metrics (length of stay, 30-day readmissions, mortality) for discharging provider influence, discharging facility, and case mix index (CMI). These metrics are securely accessible by each hospitalist on their mobile phone. Features, such as anonymous peer comparison, graphs of progress over time, and prioritized case review, offer additional support for user-directed practice evaluation. Personalized text notifications give hospitalists new insights on performance specific to disease categories (e.g. congestive heart failure, COPD). Conclusions: Hospitalists engaged with the mobile platform approximately 50% of shifts. Users specifically stated that they appreciated the easy access to data, adjusted metrics, and peer comparisons. Users commented that data on how their specific actions impacted these metrics would increase engagement and understanding of how to change practice. Complete analysis of length of stay effects are pending, but preliminary analysis shows a significantly lower length of stay for patients discharged by users of the tool compared to non-users after six months of use. Further studies are needed to determine long-term engagement and impact on length of stay and other metrics across diverse hospital settings. Future features include highlighting the relationship of hospitalist actions (e.g. labs, imaging, consults) on key metrics, user feedback channels, and knowledge sharing functionality. Alvarez, DM; Helton, K; Periyanayagam, U. IMPACT OF INDIVIDUALIZED METRICS AND MOBILE DELIVERY ON HOSPITALIST ENGAGEMENT AND OUTCOMES. Abstract published at Hospital Medicine 2018; April 8-11; Orlando, Fla. Abstract Top 15 Research & Innovations. https://www.shmabstracts.com/abstract/impact-of-individualized-metrics-and-mobile-delivery-on-hospitalist-engagement-and-outcomes/. Accessed April 22, 2019.